This entry was posted in Buying Advice and Reviews, Equipment and Upgrades and tagged lenses, nikon, photography, starter lenses by Lee. Bookmark the permalink. By accident, I did exactly that. I had the 18-200mm lense at the beginning. Loved it, even though the aperture is kind of weird when the light is away. I added a 50mm 1.4 and learned to adore fixed focal length lenses. I do a lot of concert shooting and to this day, the 50mm is my favourite. Even though, you have to be quick and precise not to blur out the face of the artist. Which happens a lot with 1.4 or 1.8 aperture. I added a wide-angle lense (12-24mm) next and still love it, too. After that another two fixed focal length ones followed (8.5mm and 35mm) which I adore. All of them. I have used all of them on concerts or theatre stages. Funny enough, especially the fish-eye-lense – while being the most difficult one to compose a shot with (you hardly can crop it in lightroom, most of the time, my own feet are in the shot, too), the bands love pictures showing the whole stage and the audience. Now, the latest one is a 24-70mm 2.8. I am excited. I used it for my last shot here on wordpress and will put it to an intense test in london next week. This is what I think: Anyone starting to shoot should get something like a 18-200 or maybe a 24-70mm lense in case they are not full-frame. To get used to the camera first and have a bit of range to get objects nearer or be able to shoot at closer range. The next thing would be to get your hand on a prime lense and try if it works out for you. I know a few friends who can’t live without a zoom, others only use a fixed focal length, since they do not want to waste time trying out, zooming to hit an object. In any case, try out both worlds, try out different aperatures, try them out in different light conditions. Learn to compose a shot get closer to objects with a 50mm lense and see the effect, do the same with a 200mm lense and see what changes in your shot. This is what I love about photography, you can try out so much stuff, see and learn how it influences your shot. And then use it to craft a shot you love and everyone else is stunned for. Hi there, first time reader and complete noob to the world of DSLR. I recently bought a D7000 and it came with a stock 18-55 lens. I then went ahead and bought a 55-300 lens. I am getting into catwalk photography and love the “bokeh” effect I see constantly where the model almost leaps out of the photo whilst everyone in the background is slightly out of focus. Are any of my lenses capable of doing this? Should I be looking into a prime? Maybe a 50mm or 35mm with a smaller F? Let me know and love the site, I’ll be a regular reader for sure!! Hi Paul, and thanks for stopping by Enthusiast Photographer! Apologies for the slow reply, I was in China on business, and didn’t have much connectivity. Anyway, the lenses you have are generally called “kit lenses” – they are pretty good, and really versatile for general photography with the total zoom coverage, but not great in low light. First of all, I’d recommend a 35mm prime no matter what else you decide for catwalk shooting. The Nikon 35 f/1.8 is a really affordable lens (around $200 new) and gives you that “normal” view the classic “nifty fifty” lenses are famous for on film cameras and full-frame digital. For catwalk shooting, I suspect you will be a little farther away from the subjects, so a longer prime might be a good choice. The Nikon 50mm and 85mm 1.8 primes are not expensive ($215 and $500 new) and are both amazing. I love my 85 f/1.8 for portraits. The only thing I’ll say is that a fixed-focal-length lens might be a challenge. You might consider a constant-aperture zoom, but I’ll warn you – they start pricey and go up from there. Even a used 80-200 f/2.8 is $750+. The next step up would be a used 70-200 f/2.8 VRI, which is around $1500 used. They are pretty heavy though – not much fun if you’re shooting for a long time or traveling. I hope this was useful – feel free to ask more questions. Cheers and happy shooting!! 50mm Canon F1.8 – Cheap and good, don;t use it as much as the 20mm though. 8mm Samyang Fisheye – Great for Mountain biking! Sigma 70-200 F2.8 – Along with the 20mm my most used lens, use it for events, sports and pet photo’s heaps. Regrets? Nah – Could of gone a Sigma 10-20mm instead of the prime maybe? Zofie – thanks for visiting and especially for commenting! Honestly, I doubt the D3000 is limiting you as much as your lenses. A really adore my 35 f/1.8. It is my go-to lens when I’m shooting creatively. The 18-200 is my walk-around and it is a terrific travel lens (and I travel a lot). I’m not a big fan of either of those kit lenses, and I think you’ve already seen the benefit of better glass with your 35mm f/1.8. 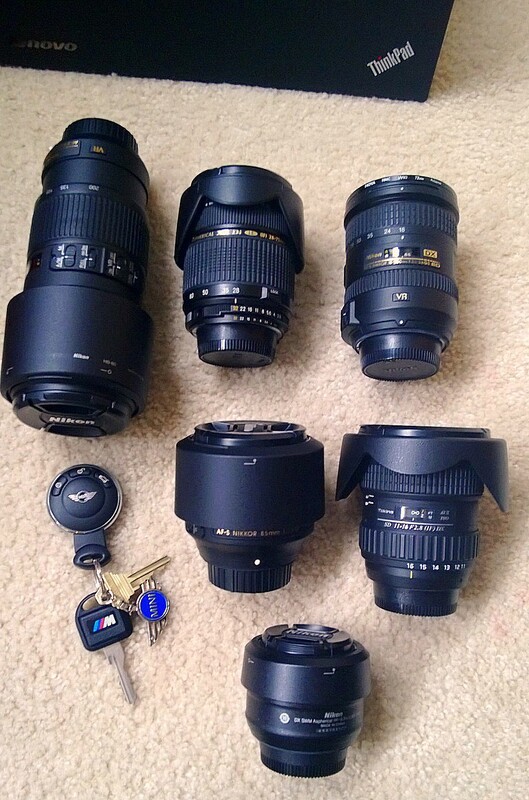 I’d keep the D3000 and focus on other lenses. The 18-200 can be had pretty affordable used (check the buy/sell at FredMiranda forums: http://www.fredmiranda.com/forum/board/10). If you like portraits, it is hard to beat the 85 f/1.8G. Some of my favorite people shots have been made with that lens. I doubt your camera is your big limitation. I’d recommend you focus on lenses for a while and then maybe check out a used D7000. They are amazingly cheap for the level of camera they are. Visit and comment often – I’d be happy to give any advice, too! Funny you say that, a refurbished d7000 is exactly the camera I’ve been looking into!